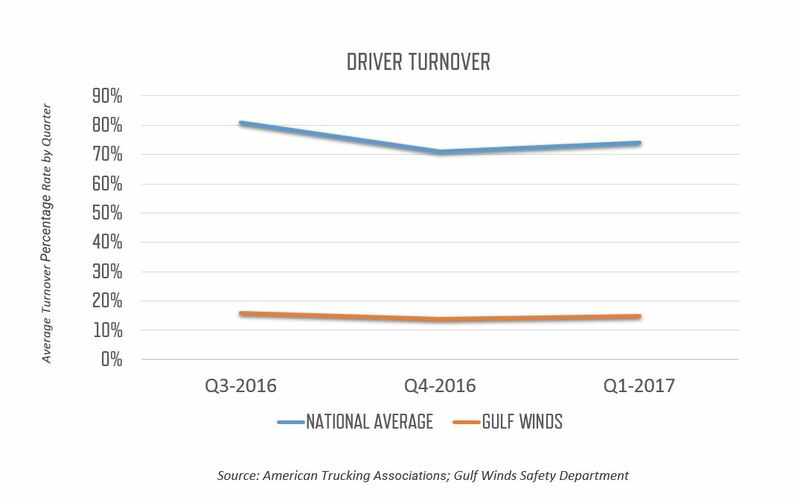 Gulf Winds consistently leads the industry in low driver turnover. The secret may be simpler than you think: CULTURE. Gulf Winds Corporate Values center around investing in people: Humility, Integrity, Stewardship, Compassion, and Excellence. Investing in healthy relationships is also good for business! Retaining drivers is essential to providing consistent service, capacity, and opportunities to support the customer long term. Because of their familiarity with customer facilities, processes, and procedures, they are able to reduce the amount of time spent at a customerâs facility which expedites shipping time and reduces cost. In the trucking industry, driver turnover is a real issue. It contributes to capacity challenges, additional costs and lack of efficiency in the supply chain. High turnover increases the cost per hire, wasting valuable resources, by constantly working to fill open positions. Turnover is literally spinning your wheels! Qualification: Strong focus on owner operators who fit our culture of safety and respect for each other. Onboarding: 90 Day plan to ensure owner operator is trained in processes and procedures. Support: Operations, driver development, and safety teams all ensure communication channels are always open. Gulf Winds understands that an investment in people has a direct positive effect on our customers. Our low turnover is a direct result of these efforts.